If, like me, you're addicted to sweeeet bowls of porridge and smoothies for brekkie, then finding some inspiration for a savoury breakfast can be pretty tricky. 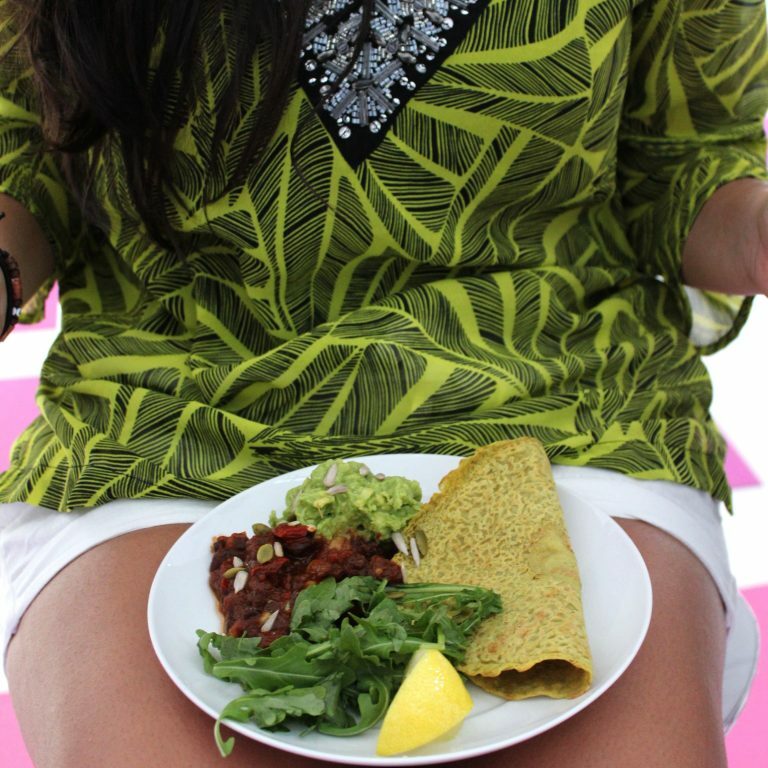 So here's my absolute fave porridge alternative - gluten-free buckwheat wraps with avocado and spicy bombay beans. This breakfast is also full of nutrients, everything from the avocado (obvs) to the wraps which I made from the best Rude Health sprouted buckwheat flour. WHY IS THIS SO GOOD FOR ME? Buckwheat is a pseudo-grain that is gluten-free and more closely related to rhubarb than to wheat. We sprout the buckwheat grain so it comes to life and releases its vital nutrients. Enzyme activity breaks down inhibitors, transforming and multiplying nutrients into their more easily digestible forms. First, prep your wrap mixture - putting all the ingredients in a bowl, whisking it up and leaving it to absorb and soak up. You want quite a runny batter mixture, so if you think you need more water then go for it. Leave this to sit for about 15 minutes while you make your beans. For the beans, start off by lightly frying the onion and garlic in a pan until the onion is translucent. Then add the pepper, finely chopped, and cook until that goes a little soft. Next add the dry spices and the finely chopped fresh chilli, and cook these for 5 minutes before adding the beans. Careful not to burn the spices as it will make your kitchen smell and will burn the insides of your nostrils! Drain the beans and then add them to the pan, along with the tomatoes, the tomato puree and all of the other ingredients apart from the fresh coriander which will be added last. If you'd like your beans to have quite a sweet kick, then add some raisins, then leave to cook on the hob for about 10-15 minutes until everything is reducing and looking like a rich sauce. Add water if it's a bit too dry. While this is cooking, you can start cooking your wraps. You want to use a hot non-stick pan and a couple of drops of coconut oil per wrap. Pour about half a ladel-ful of the mixture into the pan per wrap, and cook for at least 3-5 minutes per side, making sure the heat isn't too high. I usually wait for the top to start cooking through slightly, before flipping over to cook the other side. Stack them up on a plate as they cook and cover with a clean cloth - the steam will help them all to go soft rather than crisping up. Finally turn the heat off the beans and add the chopped coriander to the pan. Then smash up the avocado with the lime and seasoning. All you need to do now is serve everything up, with a bit of rocket or salad on the side if you fancy, plus a sprinkling of seeds and chilli flakes to make your plate look even more beautiful!